"On the morning of October 23, 1864, Federal cavalry under General Alfred Pleasonton forced a crossing of the Big Blue at Byram's Ford and assaulted this hill which was defended by General Marmaduke's Confederate Division. 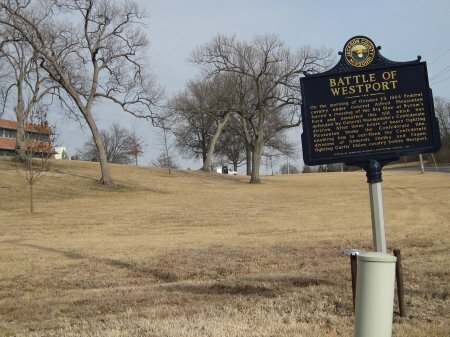 After three hours of heavy fighting Pleasonton broke the Confederate line, enabling him to out flank the Confederate Divisions of Generals Shelby and Fagan fighting Curtis' Union cavalry before Westport." Directions to Stop #18: This tour stop is located at the northeast corner of 63rd Street and Elmwood. Get back on 63rd Street heading east and turn right (north) onto the first street (Elmwood Avenue) you come to. The marker is on your right. This tour stop is located in Kansas City, Missouri 64132. "Fought desperately. Under a most frightful fire for one hour. Wounded passing by me. Capt. Blair of 4th killed and Lt. Christian mortally wounded. Capt. Vansickle and Hamilton of 4th severely wounded. Lt. Dale mortally wounded. Lt. Brison and Barclay wounded. Brown struck on pistol handle. Col. Crittenden knocked down with spent ball." From your vantage point, Philips' First Brigade was attacking on the right and the Fourth Cavalry Brigade commanded by Colonel Edward F Winslow attacked the Confederate positions on your left. Some time after 11:00 A.M., both Federal brigades made another charge against the rocky ledge and this time was able to push the defenders back up the hill into the wooded crest of the hill where Marmaduke's main line was positioned. This is the position up the hill just in front of you. Colonel Winslow was wounded and command of the Union Fourth Brigade went to Lt. Col. Frederick W. Benteen. The Federals continued to advance up the hill. The advance was successful and Marmaduke's Division was withdrawing in retreat. The retreating Confederates quickly passed by where you are currently standing. The Federals cavalrymen kept up their pressure on the retreating Confederates. The rebels kept up steady resistance, but were pushed back out of the timber and onto the prairie by the Federal advance. Once out in the open, Marmaduke was exposed to fire from the Federal Battery H, Second Missouri Light Artillery. At this point they turned and quickly withdrew to the west. The Federals advanced Battery H up to Hinkle's Grove (Tour Stop 11). Now the battery was in position to hit Shelby's right flank. They fired on the Iron Brigade just as Curtis launched his general charge by the Army of the Border.